74-year-old man had walked for nearly 20 kilometers before a passing night patrol spotted him outside Hanoi. An elderly Japanese teacher who had got lost and walked for nearly 20 kilometers on the Thang Long Highway in Hanoi was lucky to be found by traffic police on a night patrol. 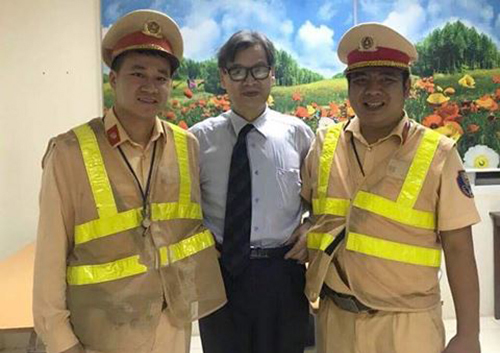 Police spotted who they thought was a middle-aged man wandering in the middle of the highway at around 8 p.m. on June 7, the An Ninh Thu Do reported. When they approached him and found that he was a foreigner, the police took him to their station so he could rest his legs. They also gave him some water to drink. The man was later identified as Naoto Imagawa, a teacher from Japan. Police said they used “translating devices” to communicate with the teacher, and found that he was working for the A Chau Human Resource Training Company in Hanoi. The company helped the teacher get home safely after the police informed them about Imagawa’s whereabouts. A translator with the company said the teacher had got lost after walking on road in front of his house, and could not catch any taxi to get back. Imagawa said he was shocked that he’d walked for nearly 20 kilometers. He profusely thanked the police for helping him.